The current Premier of Ontario is Kathleen Wynne has a Fair Hydro Plan (FHP). The freshly released legislation enabling the implementation of the FHP will soon be rushed through into law - assuming there's not four decent Liberal members of the Ontario legislature to vote against it. The Financial Accountability Office (FAO) estimates that the proposed Fair Hydro Plan (FHP), consisting of the provincial HST rebate, electricity cost refinancing, and changes to electricity relief programs, will cost the Province $45 billion over 29 years while providing overall savings to eligible electricity ratepayers of $24 billion. This results in a net cost to Ontarians of $21 billion. That doesn't seem "Fair". While polling suggests the vote buying scheme is working, there is growing evidence that sleazy disregard for responsibility is corrupting the public sector entities involved in the electricity system.t. The graphic shows the average monthly costs exactly as reported without attempting adjustments for differences introduced to keep the rate in 2016 below what was planned, which include calculating at 750 kilowatt-hours (kWh) per month instead of 800, and ending the Debt Retirement Charge. These small differences don't change the message families around the province should take from looking at government intervention in the sector since 2008: the people offering you a hand up are the people who knocked you down - and the hand they are offering is not their own. I estimate electricity supply costs, and the IESO does something to produce something they call estimates. When compared the two are often related, but sometimes the IESO's "estimate" strikes me as inexplicable. For instance, its first estimate for the May global adjustment. The last row is the one I want to focus on, but I will note my April 28th estimates, for April's Class B rate and overall total global adjustment, were closer to the IESO's final (not that their final captures all costs for April supply ). My 1st estimate for May's global adjustment, is much higher than any previous month - in fact it's much higher than the $127/MWh record monthly full commodity rate set last November (class B global adjustment plus weighted average Hourly Ontario Energy Price). The calculation is pretty simple though: My $111/MWh estimate for April's global adjustment was $42 higher than the IESO's first estimate for April ($68.74), so I added the $42 to the my $111 April (2nd) estimate in estimating the next month's 1st estimate to make up for the shortfall. When the IESO released it's low 1st estimate for May - and $106.23 will be much lower than the final global adjustment rate for May - I briefly wondered what I got wrong, and then recalled deja vu all over again. In April 2014 I'd predicted a high May 1st adjustment, and when it didn't happen I wrote on it - questioning the integrity of the IESO. The difference is small, but there is a clear difference for consumers billed on the 1st adjustment, who would have paid less over the years. While it fluctuates, most of the difference could be attributed to April and May 2014. I don't think I got anything wrong 3 years ago - I think the IESO fudged a number to avoid posting a shockingly high 1st estimate, and I think they just did that again. Fluffing over the rules to avoid embarrassment would be perfectly understandable as it's hard to see anybody standing on principle in Ontario's electricity sector today - given the example of the Premier's farcical Fair Hydro Plan. Regardless of whether or not the IESO fudges the 1st estimate of the Global Adjustment, examining its usage in billing raises some interesting question about what pricing methods consumers would prefer, if they had a choice. I suspect they'd pay the little bit more for more consistent pricing. 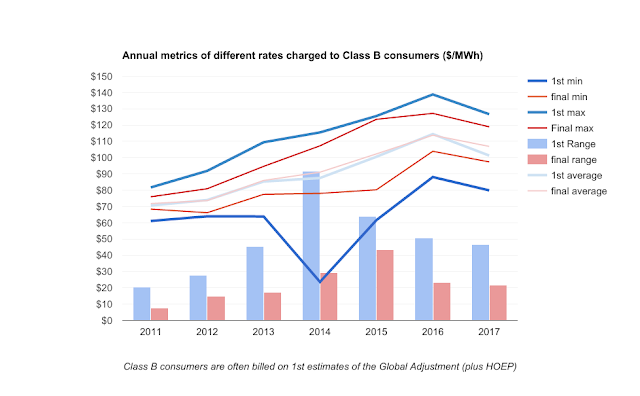 While paying on the 1st estimate may have slightly benefited Class B consumers, each year they experience months with higher rates than final numbers justify, as well as lower rate months. The variance in monthly pricing is far more volatile due to the usage of 1st estimates in billing. The OEB, at the direction of the government, uses the term "rate smoothing" quite frequently: in Ontario Power Generation rate payment hearings, and in Regulated Price Plan reporting. The Ontario Energy Board should put a stop to billing based on global adjustment estimates. The tweet linked to a demonstration of a real consumer having an unnecessarily expensive month due solely to the rate roughing of bills caused by the use of the 1st estimate of the global adjustment in billing. Why is rate smoothing important for the residential consumers but unimportant to a category of consumer perhaps best described as employers? To the government the answer is obvious - residences house voters. To the companies delivering the electricity there is a benefit of receiving payment a couple of weeks earlier, but with the low interest rates of recent years this benefit is worth next to nothing - particularly if the IESO's rates don't recover as much from customers billed a couple of weeks early. Most issues in Ontario's electricity sector have been institutionalized. There are regulations determining billing periods and which rate can be used, etc. Employees at the OEB can now do a bad job simply by doing their job - as can employees at the IESO. What there is not are, as far as I can tell, consumer champions in senior management. 3 years ago I stated the OEB's senior management should put a stop to billing on these estimates that serve only to disturb rates from month to month. This year I'll state the OEB's board to replace some of the management that failed to promote more equitable charging (both in the regulated price plan calculations and in allowing estimates in global adjustment billing(. Next year perhaps they will be. 1. The government has claimed the forecast figures in the document are outdated, however the figures I use here are historical numbers - which I have not seen disputed. 2. The IESO, to its credit, posts a breakdown of global adjustment component costs. The global adjustment is primarily the difference between the contracted cost of supply and its value on the IESO's market. April 2017 had a much lower average market price (HOEP - $11.51/MWh) than did April 2015 ($16.51/MWh), and between the two periods over 1000 megawatts of transmission-connected Tx wind capacity entered commercial operation. My estimated wind global adjustment component for wind in April was $60 million more than the IESO's reported figure, which I suspect is due to a record amount of curtailment the IESO will account for in upcoming months, but I include at the time of curtailment. Fairly perverted: Ontario's "Fair Hydro Plan"